The room was packed for Tony Wagner’s session at NAIS last Friday, and I saw afterwards on Twitter that many were asking about the presentation’s availability: here it is. 1. Regular readers know I view Tony’s work as very valuable to the movement so many of us are enthusiastic about: to transform education to a place where we are serious about assessing the skills and habits of mind that really matter, serious about preparation for the 21st century workforce, and serious about deeply engaging our 21st century students in authentic, meaningful performance tasks. I highly recommend Tony’s book to all interested in this project. 2. I really appreciate slides 7, 8, and 9, which make the point that it is not just reformist K-12 educators that care about this, it is the best universities and colleges that do also. 3. Slide 11, which uses a statement from Boston’s Mission Hill school, is a very useful elaboration upon the meaning of “critical thinking.” Critical thinking is certainly a buzz term that many of us over-use, but it still is important, even essential. Critical thinking is not just taking in information and understanding it enough to repeat it back and explain it, it is about evaluating the source, weighing evidence, considering and responding to alternative views, pattern-making, and assessing value. Use the College and Work Readiness Assessment to assess student growth in critical thinking. Check. Conduct video focus groups with recent graduates to evaluate their perception of college readiness, and share videos with faculty. We have been planning graduate surveys, but this sounds like a great thing to add, and I am going to work on it this spring. I wonder if anyone out there has a good list of questions to ask in these videotaped focus groups? Start with the 3 C’s: Critical Thinking, Communication, and Collaboration, in every classroom every day. 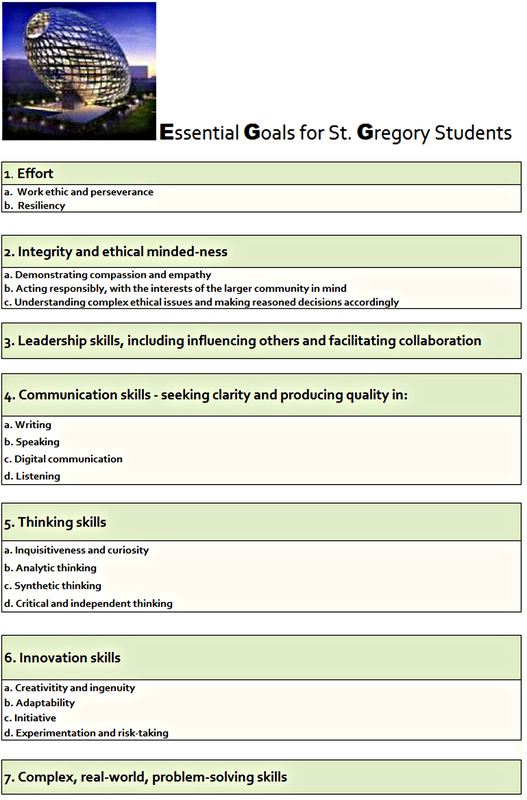 We have put all three of these things in our new report card enhancement, the “Essential Goals for Gregorians” (or EGG) (below) and we are going to try to use the backwards approach of measuring and evaluating as a vehicle to promote more teaching and learning. Require students to do internships, and phase in culminating projects and digital portfolios for all students. Our students already do internships as seniors, though maybe this could be expanded in the future. I am eager to look at building in Demonstrations of Learning performances/exhibitions into our graduation requirement; that is coming. Having launched student portfolios in the middle school this year, we are busily exploring digital portfolios for students to begin implenting in the next one to two years. Every teacher on teams for collaborative inquiry. Check: our new PLC approach, Critical Friends Groups, is exactly this. Video tape teaching, supervision, and meetings. Not yet, but we are talking about how to phase this in in the months/year to come. 5. Tony is very nice to list St. Gregory on slide 13 as an example under “consider a strategic planning process to identify critical outcomes for all students.” We did do exactly this, or rather, exactly the second half of this sentence, when we as a faculty, via our Academic Committee, determined a list of what we call Essential Goals. It wasn’t exactly a multi-constituency strategic planning process; it was a review by our academic leaders (about 15 of us) over a period of several months, and we are proud of it. Thank you Tony for the mention. 6. The four questions he ends upon, on slide 14, as challenges to the status quo, are a great tool, and perhaps belong in every strategic planning process, and above every school-leaders’ desk. What skills are you teaching, and how are you assessing them? What are you doing to systematically improve instruction, and how do you know it is working? How well are your students prepared for college, careers and citizenship, and how do you know? Is your school adding value? How do you know? 7. I should add the comment that among the things I most appreciate about Tony’s work is his focus on results, on evidence, on being serious about the outcomes that matter. Previous educational reformers have focussed upon skills, on work readiness, on authentic engagement, but have often, while doing so, failed to focus on demonstrable outcomes and accountability. Like Tony, I think these two must be married (one of the reasons Tony and I are both so enthusiastic about the CWRA is it is both: it is an assessment that measures powerfully the skills that most matter). I have been taking my 21st century presentation on the road lately, to many a Tucson Rotary Club, and as I have been doing so, I have found that often, as I speak about problem-based learning and authentic engagement and collaborative activity based learning, my audiences tend to drift, and then worry that I am less than serious about educational excellence and rigor. So I corrected course in my last presentation (available here [and if you go, my apologies for the incredibly ugly background color: what was I thinking? ), and put the entire focus of the second half of my presentation on outcomes and results. It was much better received.